Allergic to Vanilla: what to wear when you don't feel like dressing up! 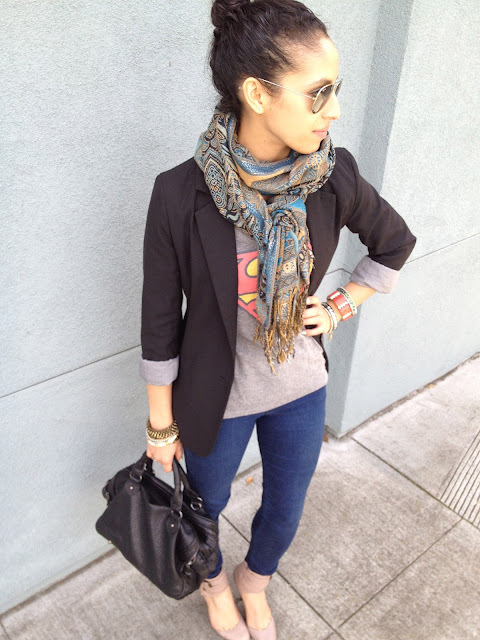 Love your casual outfit, and REALLY love your superman tee. This is basically how I dress all the time! If there's no reason to get fancy, I don't bother. You call this not dressing up?? Girllll, you should see ME when I don't dress up. This is still pretty darn cute! I love the Superman tee, so adorable. Girl you always look so polished and put together...you know I am the queen of casual rocking my sneakers once or twice a week. hehe! classy, like always! :) Those strappy heels looks so great on you, and you pull them off so well with different looks! 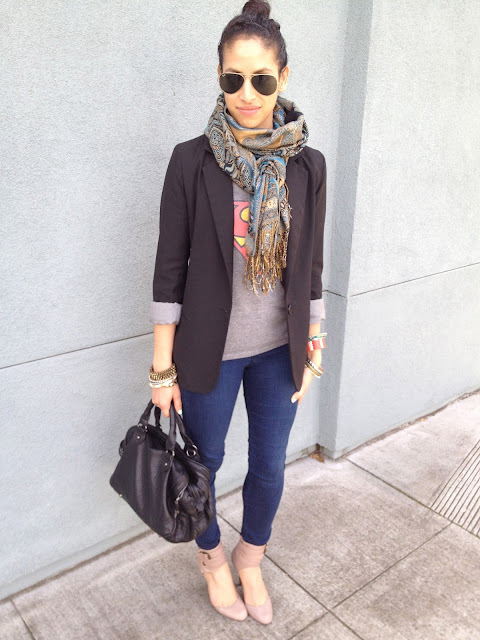 don't you love how scarves make you instantly chic??? Perfection lady! WAY cute! Cant wait to see you sooooonnn! Oh I love comfy chic looks. Blazers and t-shirts are staples in my wardrobe. You look fab! cool outfit! I love the superman tee and your shoes! I love this outfit...Very well compiled!! Gr8 blog :)....Wanna follow each other with GFC, Twitter and Facebook ? Omg you look awesome in this pic!!! I love the casual superman with the sprucing up of the scarf!! :) you should follow me on some kind of social network so you can be my professional and personal stylist lol ;) How much do you charge... Lol just kidding!! I LOVE your Superman tee so much. Great outfit doll.